After vetting a long list of potential measures, the CoC arrived at the measures listed in Table 1. Strong evidence supports using needle biopsy to determine if an abnormal finding may be indicative of breast cancer. 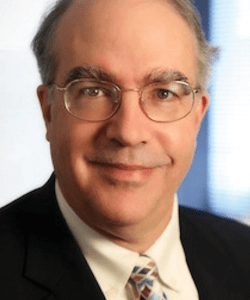 Needle biopsy for a worrisome finding on breast imaging or examination improves treatment outcomes when compared with a diagnostic surgical lumpectomy, says Dr. Edge. In 2006, the Institute of Medicine recommended that all patients completing cancer treatment be given a summary of the therapies they received as well as a survivorship care plan. 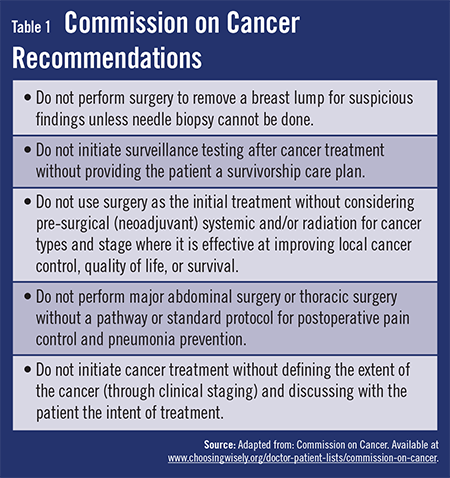 “This recommendation, however, is not being followed for most cancer patients,” Dr. Edge says. 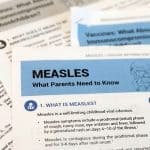 “The reasons are multi-faceted and include the time and effort it takes to create these plans and the difficulty in defining exactly how they should be constructed.” He adds that a survivorship plan explaining what tests patients should expect—and informing them that having more tests performed will not help—may reduce anxiety, uncertainty, and cost. Of the five measures created by ACS, three are related to surgical oncology (Table 2). With regard to staging the axilla for positive lymph nodes, research indicates that sentinel node biopsy is effective and has been shown to have fewer short- and long-term side effects when compared with axillary lymph node dissection. If the sentinel lymph nodes are negative for cancer, invasive axillary dissection can be avoided for patients with stages I and II breast cancer. The ACS recommends against screening for colorectal cancer in asymptomatic patients who are not expected to live beyond 10 years and in those who have no family history of the disease. This is because the risks of colonoscopy increase with age and comorbidities and because screening and surveillance modalities have been deemed inappropriate when risks outweigh benefits. 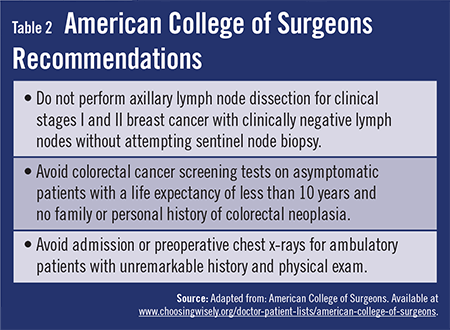 In addition, the ACS recommends against routine admission or preoperative chest x-rays for ambulatory patients who do not have other specific reasons for this test. Only 2% of these diagnostic imaging modalities lead to changes in care, according to the ACS. American College of Surgeons. Five things physicians and patients should question. Available at http://www.choosingwisely.org/doctor-patient-lists/american-college-of-surgeons. Commission on Cancer. Five things physicians and patients should question. Available at http://www.choosingwisely.org/doctor-patient-lists/commission-on-cancer. Giuliano A, Hunt K, Ballman K, et al. Axillary dissection vs. no axillary dissection in women with invasive breast cancer and sentinel node metastasis: a randomized clinical trial. JAMA. 2011;305:569-575. Weeks J, Satalano P, Cronin A, et al. Patients’ expectations about effects of chemotherapy for advanced cancer. N Engl J Med. 2012;367:1616-1625. Cowens-Alvarado R, Sharpe K, Pratt-Champman M, et al. Advancing survivorship care through the National Cancer Survivorship Resource Center: developing American Cancer Society guidelines for primary care providers. CA Cancer J. Clin. 2013;63:147-150. Burkhardt J, Sunshine J. Core-Needle and surgical breast biopsy: comparison of three methods of assessing cost. Radiology. 1999;212,181-188. Stephen B. Edge, MD, has indicated to Physician’s Weekly that he has no financial interests to report.